Hello lovelies! 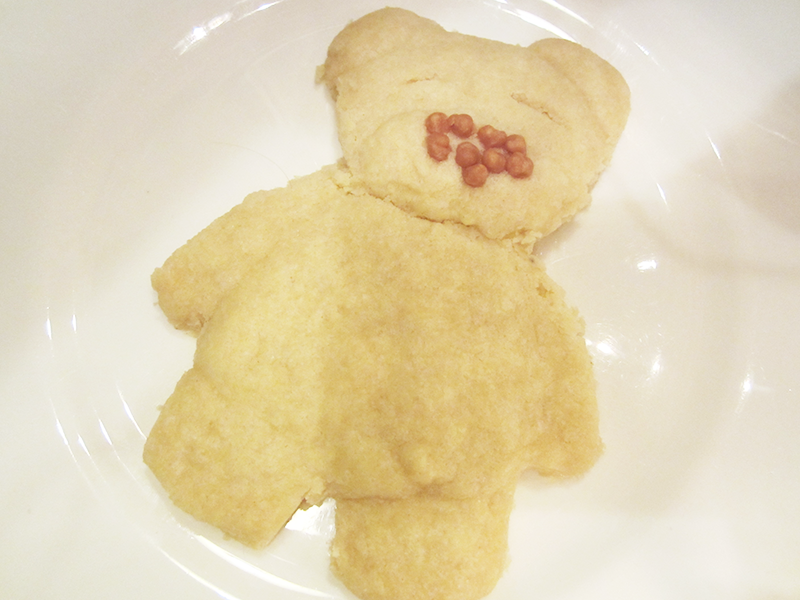 I decided to use my somewhat 'special' baking skills to attempt to make some biscuits inspired by one of my favourite Lush bath bombs ever, Butterbear. I've been wanting to do this after coming up with the idea, and finally today I attempted to try it properly. The one above is my best of four, and even it doesn't look that much like the bath bomb but hey I tried! These biscuits are essentially just shortbread so if you have a good recipe for that, then you can also use it to make these. This recipe made four of these for me but it does depend on what size you do them! First off, you want to preheat the oven (150 degrees celsius/Gas 2 or 130 degrees celsius for a fan oven). 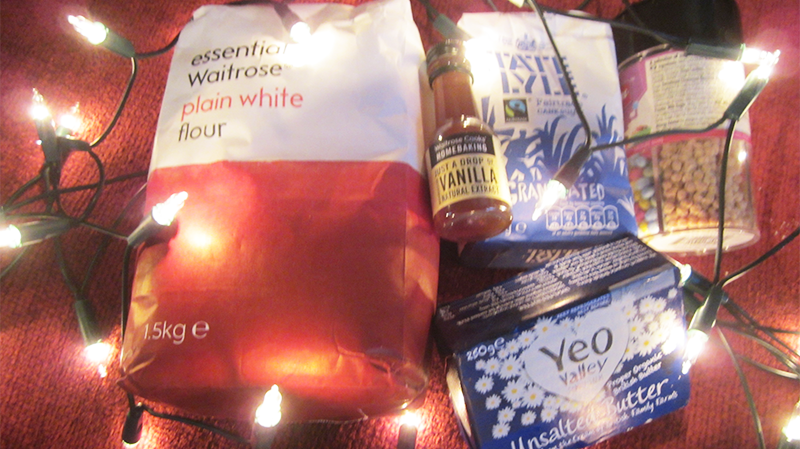 After that you need to put the flour (100g) into a bowl and add the butter (100g). Then measure out the sugar (50g), and leave on the side to add later. Rub the flour and butter together with your hands until it looks like fine crumbs. Then stir in the sugar. At this point you want to gather all the mixture together into a ball and knead it, you can do this on a new work surface with flour, but I was lazy and just kneaded it inside the bowl. Now's the hard part, crafting your Butterbear. 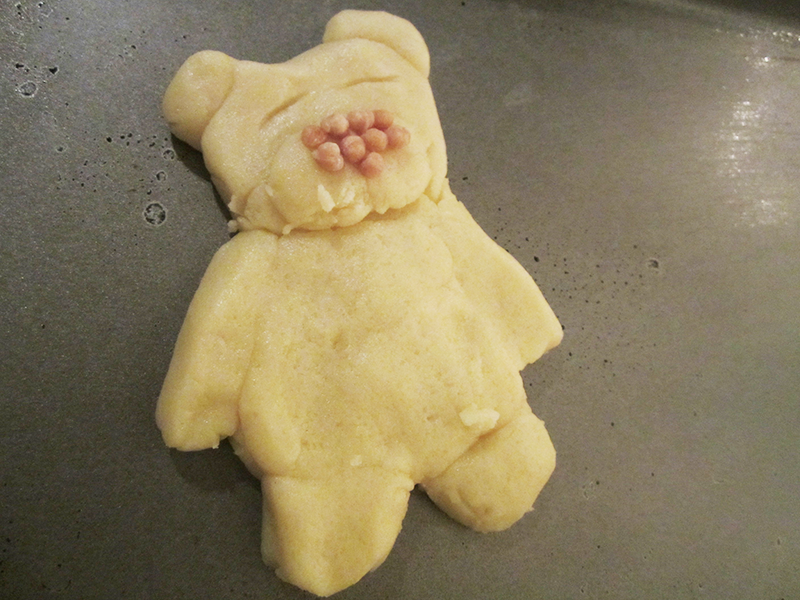 The way I went about this was drawing the Butterbear shape on to a piece of baking paper, then moulding the dough onto it but you can do it any way you want to. After getting the basic shape, I added a oval of dough onto the bottom of his face to make a snout and then added fudge pieces to make a nose (you can really use anything). Then I did two slits for the eyes. Put them onto and un-greased baking sheet and cook for 30-35 minutes. They should be reasonably pale when they come out so don't worry if they don't look cooked enough after that time. Thanks for reading lovelies! Hope you liked my attempt at baking! Let me know what you thought in the comment section below. These are so cute and look delicious! YAY recipe post, you know I love my food! LOL! You did an amazing job with the bear, it really resembles Lush Butter Bear! LOL! These look so lovely and cute. I bet they taste really good also! Wow i like this recipe these look super !nebosh igc training in chennai|Iosh training in chennai| fire and safety course training chennai|Industrial safety course in chennai| safety management course in chennai keep posting! That very good recipe so testy yummy foods . Safety Engineering Course In Chennai like i try this recipe. Its really very nice so testy and superb i like very much this is wonderful post! fire fighting training courses in chennai|fire fighting training| fire fighting course|nebosh igc training in chennai|nebosh safety course in India keep this post1 lovely article. Wow its very testy and yummy recipes! nebosh course in chennai|best safety training institute in india i will try this recipe ! Very delicious recipe ,the bear looking cute.construction safety training institute in India| best nebosh courses training institute chennai | best safety institute in chennai|Industrial safety management course in Chennai| fire and safety courses in chennai|iosh course training in india. thanks for sharing.